I'm not at all sure why either of these PHQ stamp cards should have pink as the predominant colour, but it's very convenient for me that they have. The first is from a 1978 issue about energy (maybe the pink is caused by pollution in the atmosphere?) and the second dates from 1981. 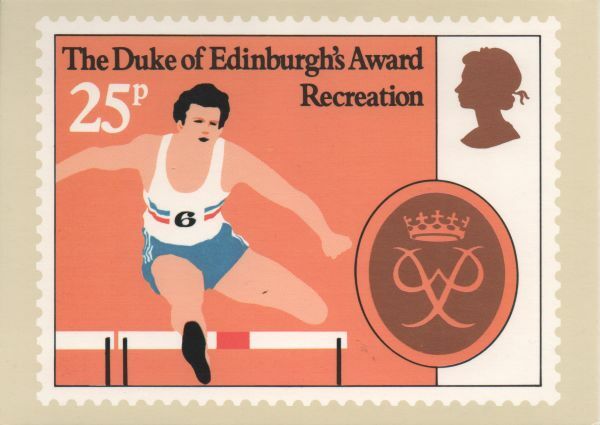 This one was part of an issue marking the 25th anniversary of the Duke of Edinburgh's Award scheme, a scheme run for young people to develop skills in various types of activity. These activities have changed a little over the years but in 1981 the four areas were Expeditions, Skills, Service, Recreation. PS, in spite of the post's title, I don't think either of the stamps are pretty or attractive at all. Of the two, I prefer the design for the oil stamp, but neither are particularly attractive. I suppose the designs are 'of their times'. You are right, they are not the most beautiful ones, but I think they capture theri time quite well - what would they put on an "energy" stamp today? To answer Marcie's question - a lot of hot air. I have that energy set imcluding Oil; never seem the other one though. I like the idea of the oil stamp, but somehow it ends up looking a little flat. The DoE stamp is just plain and non-inspiring in my mind. 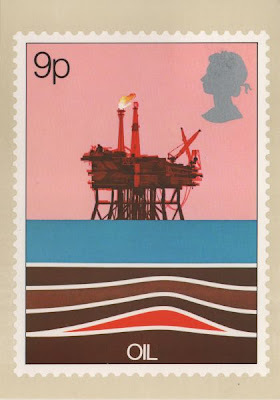 I hadn't thought of the oil stamp for pink, nice thinking. I'm in the minority in that I rather like the energy stamp set design. Visiting rather late ... Crazy week. Thanks for participating and hope to see you this week.